7 Billion People And Trillions Of Creatures To Be Photographed Together On July 19 : Krulwich Wonders... Carl Sagan once wrote a mischievous paper called "A Search for Life on Earth from the Galileo Spacecraft". Being a living Earthling, he knew he'd find life here. So what was he really up to? The experiment he ran in 1990 is about to be repeated in a few weeks. Here's my closer look. It's going to be a very small picture, but we're all going to be in it. All trillions of us on Earth. It's not our first group portrait, but Carolyn Porco, the woman in charge, says it's going to be gasp-worthy. She should know. She helped shoot some of the early ones. Well, going back a bit, here's the first one, the granddaddy of Earth pictures. It's often called the "Blue Marble" shot, and it was our first look at our whole planet suspended in space, taken in 1972 as the Apollo 17 crew headed toward the moon. It makes us look dazzlingly blue — and quite alone. The next one on my list is trickier. 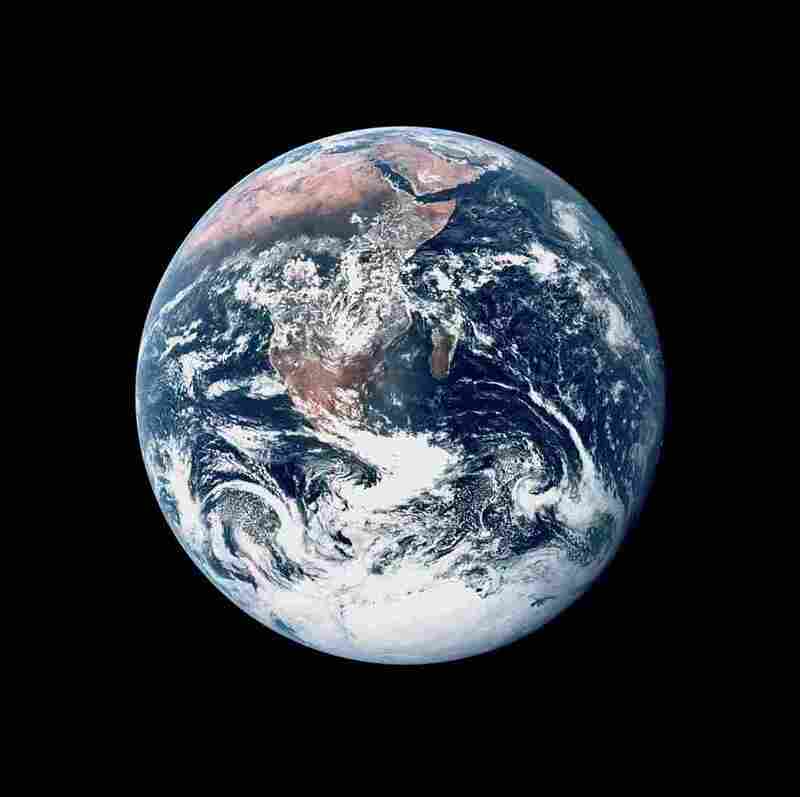 For one thing, the camera was much farther from Earth — about 3.7 billion miles away. It was on a space probe called Voyager sent by NASA to explore the outer solar system. In 1990, after traveling for 12 years, just as it was about to leave the solar system, astronomer Carl Sagan asked that it be turned around and given one last photographic instruction. Carolyn Porco was on the team that did this. Sagan wanted to make pictures of the various planets so we could see what we looked like from far, far away. Earth makes a teeny appearance here. You can find us at the midpoint of this image, inside the band of scattered sun rays at the far right, peeping through. That little dot is Earth, our planet. Looking at this, Carl Sagan thought, first, how small we look, how small we are — which inspired him to write his eloquent Pale Blue Dot meditation, which, if you haven't read it lately, take a minute and a half to look at this short version gorgeously animated by Joel Somerfield at Order, a British design studio. Carl Sagan himself is narrating. 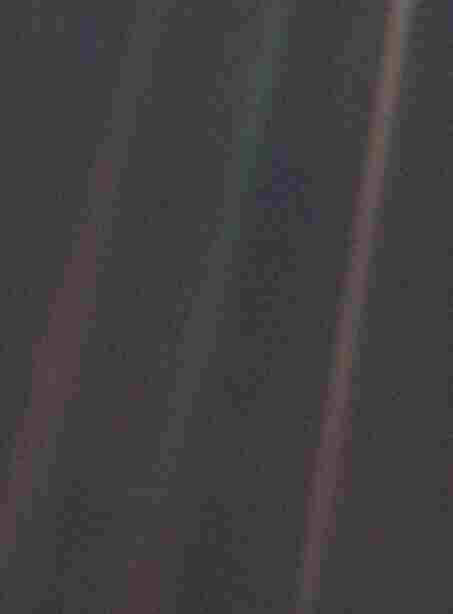 Our smallness, our alone-ness impressed Sagan, but so did our noisy colorfulness. We emit radio waves and TV signals. We have technology. We are blue in our watery parts, reddish on our land parts (because the chlorophyll in our plants "fluoresces" red light back into space). Which gave Sagan an idea. Imagine you are sweeping through a solar system, looking for a place, any place that might harbor some sign of life, and there, in the blackness, you see a dot of light, a little pinprick shining back at you. Could you, from a distance, learn if there is life there? Are there telltale signs? Sagan imagined four traits that he thought would be strong indicators of life: the persistent presence of methane, an unusual proportion of oxygen in the atmosphere (both often produced by life), a reddish coloring on land, (because of the chlorophyll) and radio waves. If the planet is broadcasting, somebody down there must be talking (and tinkering). Then he proposed an experiment — the first ever life-sensing test. He knew, back in 1990, that another NASA spacecraft, Galileo, was zipping past Earth on its way to Jupiter, so he asked NASA to turn to the probe to earth to see if it could pick up the four traits. Yup, yup, yup and yup. Methane, oxygen, reddish tones and radio waves, all of them, of course, were there. Then, because he wanted this to be the world's first-ever controlled experiment in astrobiological sensing, he asked that the probe be turned to the moon. We all know there's life on Earth, (i.e., you reading this, me writing this) and we are pretty sure that there's none on the moon. It's cold. It's barren. It's always been so. So would Galileo pick up any life traces when looking moonward? No, no, no and no. Galileo sniffed and found "Nothing," says David Noever, a NASA astrobiologist. "There was no evidence for life. No chlorophyll, no oxygen-methane atmosphere, no artificial radio transmissions. It was just as we would have expected, and consistent with the Sagan criteria." Ever since, we have been looking, using Sagan's criteria and a few more, to hunt for signs of like on distant dots of light. We like signs of water. 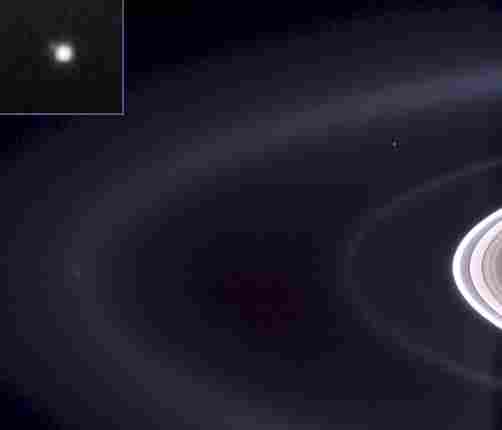 There are several watery orbs in our solar system. It's why we like the color blue. It's our color, and so it's a hue that teases us, that makes us wonder, "You too?" The last photo on my list was taken in 2006 by the Cassini probe, 930 million miles from Earth, near Saturn. You can see some of Saturn's rings on the right. Earth, once again, is a little dot in the background, but in this image, we've enlarged ourselves, so you can see us better. Carolyn Porco, now a team leader on the Cassini project, says what we see here, hanging in dark space, is a "pale blue orb, and a faint suggestion of the moon." The moon is a "dim protrusion to the upper left of Earth" and from this angle, if we could zoom in (we can't), we'd be looking down on the Atlantic Ocean and the west coast of North Africa. In 2006, this was the best Cassini could do. But Carolyn says they're going to try again, On July 19, in just a few weeks, Cassini's cameras will take advantage of Saturn eclipsing the sun, and snap a new photo. It will be, says Carolyn "an image of the highest resolution we are capable of taking." That doesn't mean we'll see cities glowing at night, or continents. What we will see, she thinks, is a telltale difference. The part of the image that is the moon, she says, will be "a colorless, star-like point of light." That's our lifeless moon. The other part, the bigger part, will have traces of color, hints of red,* and the distinct blush of blue. That little beacon of life-light, of course, is our home, our pale blue dot. Carolyn Porco and I exchanged notes after this post ran and it turns out the Cassini photograph will not pick up more than one Earth color. 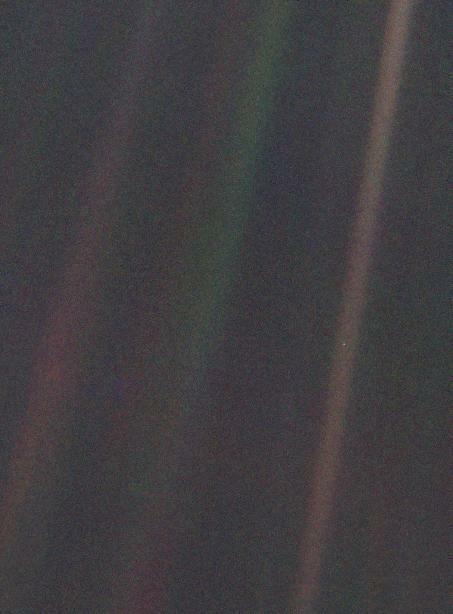 From such a distance, the Earth is so small — about one pixel across — it will blush blue and only blue. No "hints of red." One day we might be able to pick up multiple hues from 930 or so million miles away. "That would be fabulous," she wrote me, "but our cameras aren't THAT good." So expect a single point of pale light (the moon) and just over to the left, the blue dot that's us. Once the picture's been taken, you can find it here.